(Leah Hogsten | The Salt Lake Tribune) Genpo Merzel Roshi, from left, celebrates with Michael Mugaku Zimmerman Sensei and Diane Musho Hamilton Sensei after the dedication and eye opening ceremony at Torrey Zendo Meditation Center, Sept. 13, 2017, in Torrey. The Torrey Zendo, founded by Zimmerman and Hamilton, is now a year-round facility for Zen study, practice and retreats. (Leah Hogsten | The Salt Lake Tribune) l-r Tenkei Coppens Roshi, Diane Musho Hamilton Sensei, Michel Genko Dubois, Tammy Myoho Gabrysch Sensei, Michael Mugaku Zimmerman Sensei, Genpo Merzel Roshi and Catherine Genno Pages Roshi after the dedication and eye opening ceremony at Torrey Zendo Meditation Center, Sept. 13, 2017, in Torrey. The Torrey Zendo, founded by Diane Musho Hamilton Sensei and Michael Mugaku Zimmerman Sensei, located near Capitol Reef National Park, had been seasonal but is now a year-round facility for study, practice and retreats. 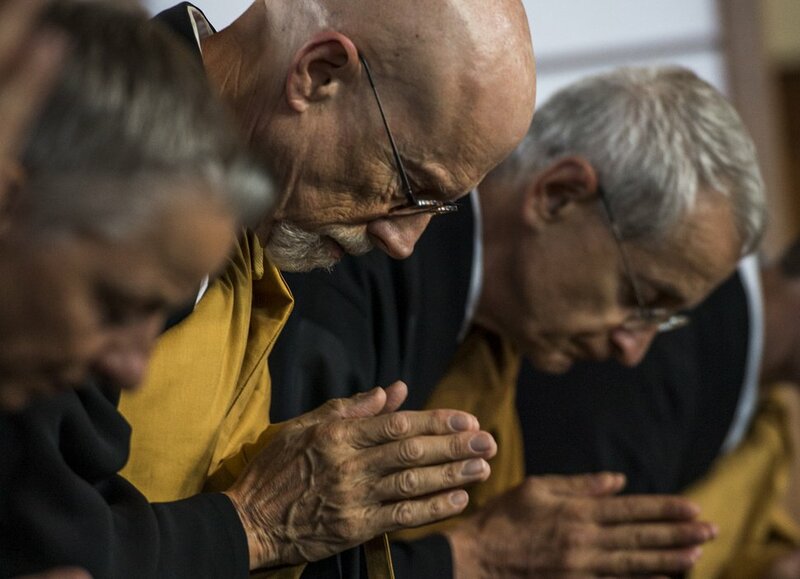 (Leah Hogsten | The Salt Lake Tribune) Genpo Merzel Roshi during the dedication and eye opening ceremony at Torrey Zendo Meditation Center, Sept. 13, 2017, in Torrey.. The Torrey Zendo, founded by Diane Musho Hamilton Sensei and Michael Mugaku Zimmerman Sensei, located near Capitol Reef National Park, had been seasonal but is now a year-round facility for study, practice and retreats. (Leah Hogsten | The Salt Lake Tribune) l-r Michael Mugaku Zimmerman Sensei reaches out to Genpo Merzel Roshi for a celebratory hug among fellow roshis after the dedication and eye opening ceremony at Torrey Zendo Meditation Center, Sept. 13, 2017, in Torrey. The Torrey Zendo, founded by Diane Musho Hamilton Sensei and Michael Mugaku Zimmerman Sensei, located near Capitol Reef National Park, had been seasonal but is now a year-round facility for study, practice and retreats. (Leah Hogsten | The Salt Lake Tribune) Tenkei Coppens Roshi during the dedication and eye opening ceremony at Torrey Zendo Meditation Center, Sept. 13, 2017, in Torrey. The Torrey Zendo, founded by Diane Musho Hamilton Sensei and Michael Mugaku Zimmerman Sensei, located near Capitol Reef National Park, had been seasonal but is now a year-round facility for study, practice and retreats. (Leah Hogsten | The Salt Lake Tribune) Michael Mugaku Zimmerman Sensei, center, during the dedication and eye opening ceremony at Torrey Zendo Meditation Center, Sept. 13, 2017, in Torrey. The Torrey Zendo, founded by Zimmerman and Diane Musho Hamilton Sensei, is now a year-round facility for Zen study, practice and retreats. (Leah Hogsten | The Salt Lake Tribune) Catherine Genno Pages Roshi and Michael Mugaku Zimmerman Sensei (center) share a laugh as their respective spouses Michel Genko Dubois and Diane Musho Hamilton Sensei share a celebratory hug after the dedication and eye opening ceremony at Torrey Zendo Meditation Center, Sept. 13, 2017, in Torrey. The Torrey Zendo, founded by Diane Musho Hamilton Sensei and Michael Mugaku Zimmerman Sensei, located near Capitol Reef National Park, had been seasonal but is now a year-round facility for study, practice and retreats. (Leah Hogsten | The Salt Lake Tribune) at the dedication and eye opening ceremony at Torrey Zendo Meditation Center, Sept. 13, 2017, in Torrey. The Torrey Zendo, founded by Diane Musho Hamilton Sensei and Michael Mugaku Zimmerman Sensei, located near Capitol Reef National Park, had been seasonal but is now a year-round facility for study, practice and retreats. (Leah Hogsten | The Salt Lake Tribune) the dedication and eye opening ceremony at Torrey Zendo Meditation Center, Sept. 13, 2017, in Torrey. The Torrey Zendo, founded by Diane Musho Hamilton Sensei and Michael Mugaku Zimmerman Sensei, located near Capitol Reef National Park, had been seasonal but is now a year-round facility for study, practice and retreats. (Leah Hogsten | The Salt Lake Tribune) l-r Michael Mugaku Zimmerman Sensei, Genpo Merzel Roshi and Catherine Genno Pages Roshi visit after the dedication and eye opening ceremony at Torrey Zendo Meditation Center, Sept. 13, 2017, in Torrey. The Torrey Zendo, founded by Diane Musho Hamilton Sensei and Michael Mugaku Zimmerman Sensei, located near Capitol Reef National Park, had been seasonal but is now a year-round facility for study, practice and retreats. (Leah Hogsten | The Salt Lake Tribune) the dedication and eye opening ceremony at Torrey Zendo Meditation Center, Sept. 13, 2017, in Torrey. The Torrey Zendo, founded by Diane Musho Hamilton Sensei and Michael Mugaku Zimmerman Sensei, located near Capitol Reef National Park, had been seasonal but is now a year-round facility for study, practice and retreats. (Leah Hogsten | The Salt Lake Tribune) Dean Fugan Gonzalez of Salt Lake City await the entrance of Genpo Merzel Roshi prior to the dedication and eye opening ceremony at Torrey Zendo Meditation Center, Sept. 13, 2017, in Torrey. The Torrey Zendo, founded by Diane Musho Hamilton Sensei and Michael Mugaku Zimmerman Sensei, located near Capitol Reef National Park, had been seasonal but is now a year-round facility for study, practice and retreats. (Leah Hogsten | The Salt Lake Tribune) the dedication and eye opening ceremony at Torrey Zendo Meditation Center, Sept. 13, 2017, in Torrey. The Torrey Zendo, founded by Diane Musho Hamilton Sensei and Michael Mugaku Zimmerman Sensei, located near Capitol Reef National Park, had been seasonal but is now a year-round facility for study, practice and retreats. (Leah Hogsten | The Salt Lake Tribune) l-r Catherine Genno Pages Roshi, Michael Mugaku Zimmerman Sensei and Michel Genko Dubois share a laugh prior to the dedication and eye opening ceremony at Torrey Zendo Meditation Center, Sept. 13, 2017, in Torrey. 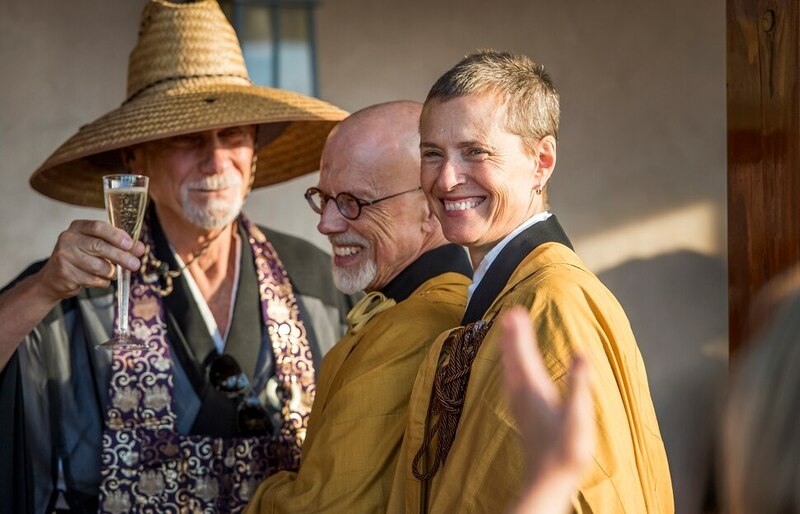 The Torrey Zendo, founded by Zimmerman and Diane Musho Hamilton Sensei, is now a year-round facility for Zen study, practice and retreats. (Leah Hogsten | The Salt Lake Tribune) the dedication and eye opening ceremony at Torrey Zendo Meditation Center, Sept. 13, 2017, in Torrey. The Torrey Zendo, founded by Diane Musho Hamilton Sensei and Michael Mugaku Zimmerman Sensei, located near Capitol Reef National Park, had been seasonal but is now a year-round facility for study, practice and retreats. (Leah Hogsten | The Salt Lake Tribune) the dedication and eye opening ceremony at Torrey Zendo Meditation Center, Sept. 13, 2017, in Torrey. The Torrey Zendo, founded by Diane Musho Hamilton Sensei and Michael Mugaku Zimmerman Sensei, located near Capitol Reef National Park, had been seasonal but is now a year-round facility for study, practice and retreats. (Leah Hogsten | The Salt Lake Tribune) Michael Mugaku Zimmerman Sensei and Diane Musho Hamilton Sensei celebrate after the dedication and eye opening ceremony at Torrey Zendo Meditation Center, Sept. 13, 2017 in Torrey. 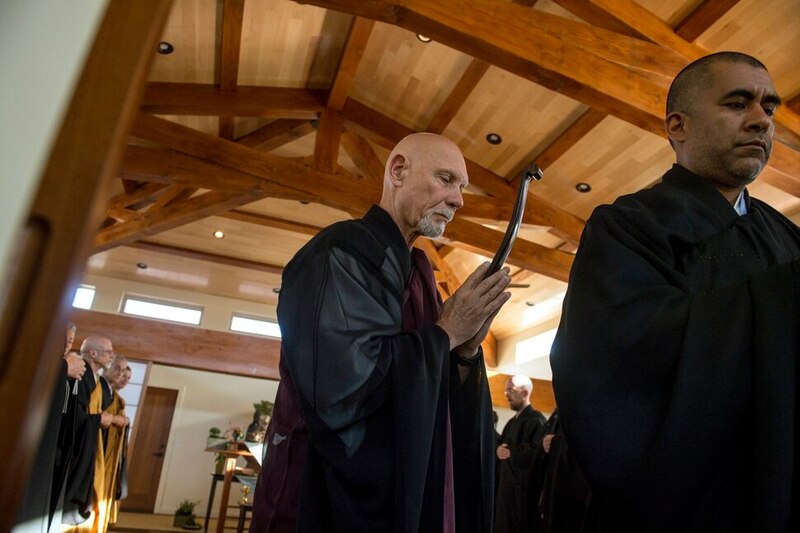 The Torrey Zendo, founded by Zimmerman and Hamilton, is now a year-round facility for Zen study, practice and retreats. (Leah Hogsten | The Salt Lake Tribune) the dedication and eye opening ceremony at Torrey Zendo Meditation Center, Sept. 13, 2017, in Torrey. The Torrey Zendo, founded by Diane Musho Hamilton Sensei and Michael Mugaku Zimmerman Sensei, located near Capitol Reef National Park, had been seasonal but is now a year-round facility for study, practice and retreats. Torrey • The silence was deafening. 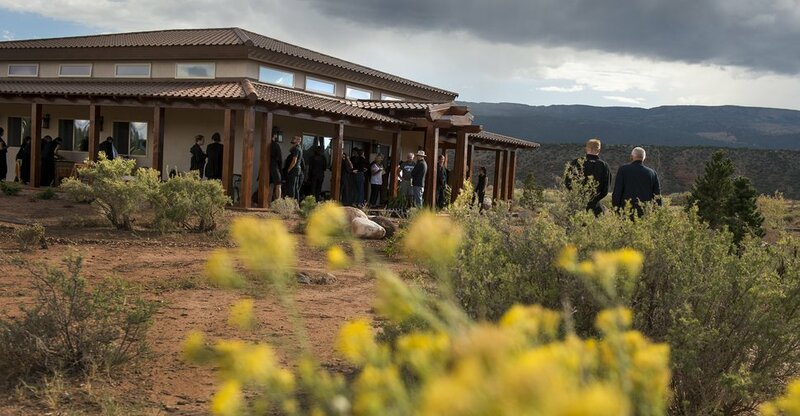 For several minutes, about 75 teachers and students of Zen Buddhism stood in meditation in the newly constructed temple surrounded by the redrock monoliths that make up Capitol Reef National Park. They came from Holland, France, Colombia, Venezuela, Brazil, Mexico and Canada to celebrate the dedication Wednesday of the Torrey Zendo Meditation Center, the dream of former Utah Supreme Court Justice Michael Zimmerman and his wife, Diane Hamilton. It seemed a perfect assimilation between the inner-self discipline of Zen and the awe-inspired surroundings of colorful domes and serenely deep canyons that Native Americans once called the Land of the Sleeping Rainbows. “The bones of the Earth are not hidden at Capitol Reef. It reminds me of the cycles of life,” said Corinne Saunders, of Calgary, Canada, a retired pediatrician and monk who attended the ceremonies. (Leah Hogsten | The Salt Lake Tribune) The Torrey Zendo Dedication and Eye Opening ceremony at Two Arrows Zen Meditation Center, September 13. 2017 in Torrey. The Torrey Zendo, founded by Diane Musho Hamilton Sensei and Michael Mugaku Zimmerman Sensei, located near Capitol Reef National Park, had been seasonal but is now a year-round facility for study, practice and retreats. The massive vistas help empty one’s mind to experience inner peace, said Zimmerman, who with Hamilton founded Zen Buddhist meditation centers in Torrey and Salt Lake City. Inside the center, the silence was broken by the chiming sound of a metal rod tapping the rim of a bell. That was followed by reverent attendees chanting in unison, a representation of joy and compassion, Zimmerman said. The chants seemed to come deep from souls of the individual members, but the voices came together as one. The ceremony continued with the burning of incense, bowing with hands in a prayer position, a tradition showing respect, called gassho. Respects also were paid to a statue of Manju Shri, a male figure representing wisdom, and to Kanzeon, a female figure representing compassion. Together, they are considered enlightenment. Zimmerman and Hamilton had opened the Torrey meditation center in 2007, but it was small with accommodations consisting only of a large canvas tent. The husband-wife team opened Artspace Zendo in Salt Lake City four years later but always returned to Torrey, where Hamilton has had a home since the 1980s. Enveloped by exquisite earthly and celestial vistas, they decided to expand the Wayne County Zendo meditation center and build a more permanent facility. Both are ordained teachers in the lineage of the late Taizen Maezumi Roshii, a Japanese Buddhist teacher and the founding abbot of the Zen Center of Los Angeles who opened other centers across the United States, Mexico and Europe. Hamilton is known as Diane Musho Hamilton Sensei; Zimmerman is Michael Mugaku Zimmerman Sensei — titles they received after completing their Zen Buddhist training. (Leah Hogsten | The Salt Lake Tribune) Michael Mugaku Zimmerman Sensei, center, during the Torrey Zendo Dedication and Eye Opening ceremony at Two Arrows Zen Meditation Center, September 13. 2017 in Torrey. 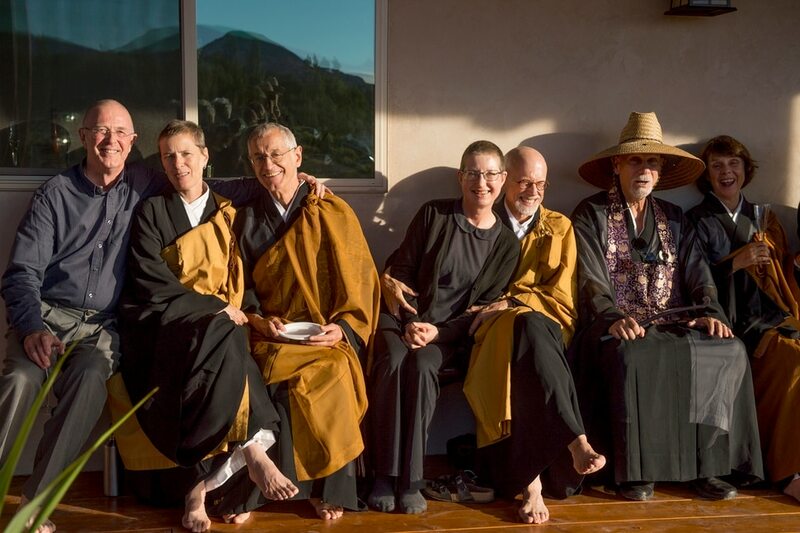 The Torrey Zendo, founded by Zimmerman and Diane Musho Hamilton Sensei, is now a year-round facility for Zen study, practice and retreats. Their approach is broad. Some attendees simply want relief from stress or pain while others seek more strictly Buddhist teachings. Daily meditations for the former are free while there are membership costs for more detailed programs, workshops and retreats. Hamilton’s and Zimmerman’s paths to Zen were as different as their own experiences and heartaches. Zimmerman was a Utah Supreme Court justice and has since returned to private law practice. He was reared as a Presbyterian, and later he and his late wife, Lynne, attended the Episcopal Church in Utah. When Lynn died of cancer in 1994, Zimmerman tried meditation to cope with grief, responsibilities of the court and life as a single father to three young daughters. Hamilton was an accomplished horsewoman, once crowned as Miss Rodeo Utah. When she first began meditating, she became more aware of the environment and could slow racing thoughts while riding in the mountains surrounding her Tooele hometown. When her only child, Willie, was born in 1989 with Down syndrome from her first marriage to artist Tony Smith, Hamilton already had some coping skills. The public is invited to weekday meditations at the Torrey and Salt Lake City centers. There is no cost, and no prior experience with meditation or Buddhism is expected or required. More detailed programs, however, have a fee. Torrey Zendo Meditation Center: Open house from 2 p.m. to 4 p.m. Saturday at 57 S. 300 West, Torrey. Daily practice from 7 a.m. to 8:15 a.m. Monday through Friday and 5 p.m. to 6:30 p.m. Monday through Friday through the end of October. Artspace Zendo: 230 S. 500 West, Suite 155, Salt Lake City. Daily practice from 7 a.m. to 8:30 a.m. Monday through Friday; meditation class 7 p.m. to 8:15 p.m. Thursday; dharma class from 6:30 p.m. to 8:00 p.m. Tuesday; sitting class from 7 p.m. to 8:15 p.m. Thursday; and a mindfulness class from 10 a.m. to 11:30 a.m. Sunday. For more information visit www.twoarrowszen.org.